A small cloud of smoke pours out of an automobile. A man and a woman are seen standing nearby and gesticulating. Woman: Our car is on fire. Quick, dial the fire department! Man: My cellphone's inside the car! In the next panel, the smoke cloud is larger. The man and woman are looking up at the sky. A figure of a man flies into view at a slightly downward angle as if about to land. 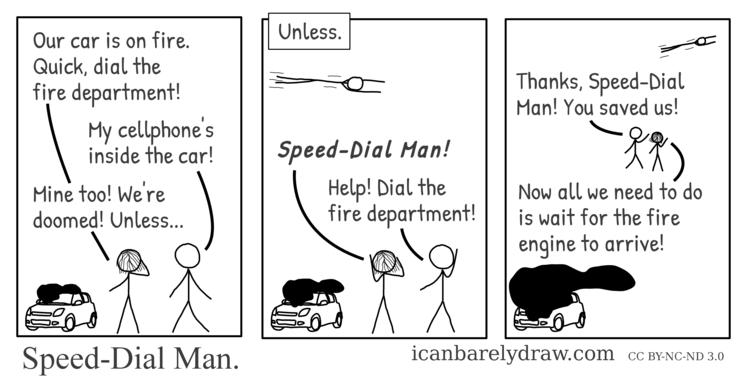 Man: Help! Dial the fire department! In the next and final panel, the smoke cloud is much larger and looms larger than the automobile. The figure of the flying man is smaller and is flying at a slightly upward angle, as if it has just taken off. The man and woman are waving towards it. Man: Thanks, Speed-Dial Man! You saved us! Woman: Now all we need to do is wait for the fire engine to arrive!